Learn about natural gas' excellent safety record and see what we're doing to enhance safety. Typically, natural gas that accidentally escapes in the open will dissipate harmlessly into the air. However, when a gas and air mixture within the flammability range collects in a confined space, it can ignite. Because natural gas in its raw state has no smell or color, we add the "rotten egg" odor to make you aware if natural gas is leaking. If you smell gas , leave the area immediately and call 800-427-2200. We will send a trained technician to investigate. Learn more about natural gas safety . At SoCalGas®, our core value is safety. We proactively collaborate with public officials , emergency responders, excavators, safety advocates and the public to continue to improve our long-standing record of providing natural gas safely and effectively. We’re working with the California Public Utilities Commission (CPUC) to continue to cost-effectively enhance the safety of our infrastructure, and we’re funding research to help us better detect and address leaks earlier. Transportation by pipeline is the safest form of energy delivery in the country. 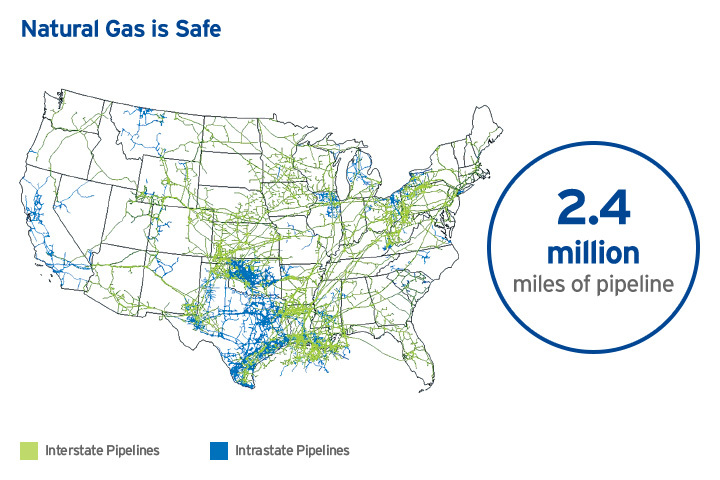 Natural gas pipelines, which transport approximately one-fourth of the energy consumed in the U.S., are an essential part of the nation's infrastructure. Courtesy of the American Gas Association. During the next five years, we’ll be investing approximately $6 billion to maintain and improve safety, reliability and service to our customers. And, we’re currently working on our largest capital project in the company’s history – our Pipeline Safety Enhancement Plan or PSEP. We construct, operate and maintain our pipeline system to meet or exceed applicable federal and state regulations and requirements. We routinely perform various pipeline safety and maintenance tasks, including patrolling, inspecting, testing, repairing and replacing pipelines.